On a windy Denver evening, Grizfolk, Flor and Andrew McMahon in the Wilderness played a concert that brought warmth to the chilled audience. 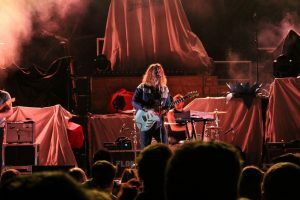 On March 9, the Filmore Auditorium became an amplifier of sound and genuine connection as Grizfolk, Flor and Andrew McMahon in the Wilderness each gave the audience both great music and good feelings. Grizfolk, a Los Angeles band, started the concert with some solid alt-indie rock. They showed off their hits like Trouble Maker and Spoonful. Their incorporation of crowd participation, by means of clapping, made everyone feel welcome. A combination of bass, guitar lines and catchy lyrics were combined in the right proportions to make Grizfolk unique. They are just gritty enough to satisfy rock fans while maintaining a good connection with fans of the pop music texture often found in newer bands. That sound can be applied to even slower jams like Bohemian Bird without sacrificing any facet of what makes Grizfolk original. After Grizfolk, Flor added positive, happy feelings to their music. By sprinkling in sentiments of genuine enthusiasm and gratefulness, Flor captured not only the ears of the audience by their hearts as well. Flor at the Filmore Auditorium. Photo by Hunter Haskins. Throughout their set Flor played popular hits like back again, and where do you go. Seeing Flor perform live influenced how I listened to their music. The smiles on their faces and their stage presence added another layer to the meaning of their songs. Bathed in the changing lights of blue, red, yellow, etc.., Flor seemed almost angelic. The sound of their voices and instruments combined to prove they were feeling the emotions that the audience was. About halfway through the set, Flor stopped to introduce and sing happy birthday to their driver from their UK tour. During the tour, they promised to bring their driver Lee to the U.S. This personal touch was refreshing to see in a world of false promises and fit the aura of the band perfectly. Andrew McMahon and the Wilderness finished the concert with a well-decorated set and lots of stories. Sometimes it is hard to imagine that rock stars are people too. McMahon’s onstage persona is inseparable from his real self. Throughout his set, he sprinkled his songs with backstories. From moving abruptly from Ohio to California to the memories of his “Nan,” everything Andrew did was deeply seeded in personal story and/or his emotions. Andrew described the set as a sort-of “beach party” and a representative piece of the “bizarro California” that he calls home. Those in attendance were more than happy to join him at the California beach party. As soon as Andrew came on stage playing a piano that was being pushed to center stage, the audience erupted and sang along until the end of his performance. With an enthusiast opening from Grizfolk, the appreciative attitude from Flor, and intimate meaning from Andrew McMahon in the Wilderness, the line up was impressive. All three bands meshed together to create a truly organic show!